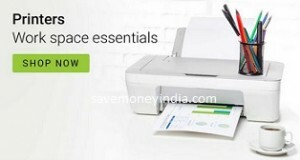 FlipKart is offering upto 40% off on Printers. Debit Card, Credit Card & Net Banking – 10% off upto Rs. 750 on Purchase of Rs. 3000+: An instant discount will be awarded at the time of making the payment. Payment Options > Credit / Debit / ATM Card > Enter Card Number OR Net Banking > Select Bank. May not be applicable on few products.